I have been working on a few pieces for a local clothing boutique that is opening a retail location in Crown Center. The shop specializes in creating garments from recycled items and clothing. Pretty cool stuff. These photos show the exterior sign. This is a two-sided piece made from 1/16 inch sheet and some 1/2 inch round bar. The rust finish on the letters was created using a mixture of saltwater and vinegar. The sign is sealed with a polyacrylic finish. The zig-zag detail is part of the store's logo. This detail was made using some round bar. I made a special jig that helped make the bends. The background of the sign has a ground finish. The whole piece fits over an existing structure on the outside of the storefront. It is fastened with several screws. Big shiny washers complete the look. Here's a look at what the sign looks like from a distance. 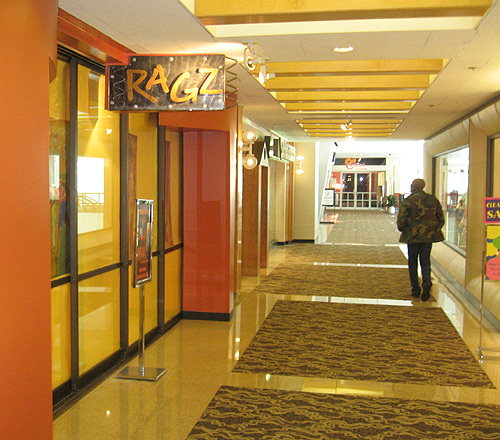 Ragz opens in early May. Check out their website here.